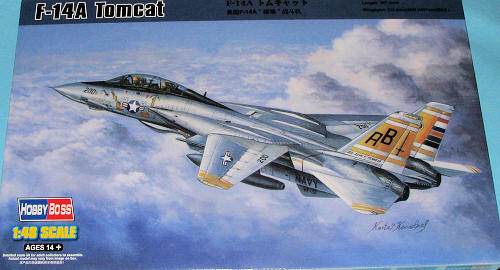 This is the sixth 1/48 F-14 kit that has been presented to the buying public. First was the Monogram kit then the Fujimi kit, then Hasegawa, Academy and finally the Italeri kit. Most modelers will agree that the Hasegawa kit was the best available in terms of detail, but the Monogram was probably somewhat easier to build. In truth, until now, no 1/48 Tomcat has been really easy to build. All of them have suffered from various problems with fit and only those few folks who have built dozens of 1/48 Tomcats (yes, I mean you, Darren), have figured out how to breeze through construction. Kit features fine engraved rivets and panel lines, well detailed tandem cockpits with nicely done bang seats, radar package face and antenna (with optional open radome), cannon bay interior, optional position slats and flaps, intake trunking, fully detailed	 engines, optional position multi-part canopy, refueling probe, optional deployed boarding steps, separate speed brakes, very nicely detailed wheel wells and landing gear, vinyl tires and a nice photo etch fret for the radar array, seat harnesses and the canopy rails. The interior instrument panels and consoles have nicely done raised detail and decals that one can use if that is the desire. Like almost every Tomcat kit, the forward section is split vertically with the aft split horizontally. 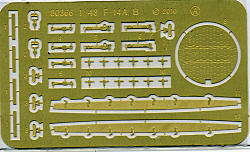 The kit wing leading edges will need small strips removed for the little vanes that were part of the F-14A airframe. You may be pleased that the wings are not interconnected, at least not that I could determine from the instructions. There are different pieces to fit into the fuselage at the wing root depending on if you build the kit with the wings swept forward or back. Both wide open and closed exhaust nozzles are provided. Tomcats normally shut down one engine first and then the other, which results in one set of burner cans being wide open while the other are closed. Look at photos to verify this. Frankly, I'm not sure why Hobby Boss provided full engines as you won't see them when the kit is finished. From the final compressor aft would have been enough. The kit does include a full weapons suite, including different wing pylons if you wish to mount a pair of Phoenix out there. You get four Sparrows and two Sidewinders as well as a pair of drop tanks. The instructions are well done with the usual nicely drawn construction steps. There is a list of parts that won't be used on this variant, which is nice to halve. A full color painting and markings guide is offered for two light gull grey over white planes; one from VF-32 as shown on the box art and another for a black nosed VF-41 plane from their initial operations. 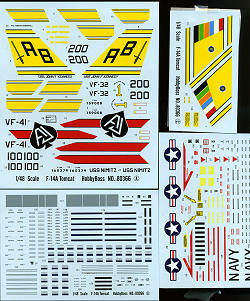 There are five decal sheets (the one for the instruments isn't shown) that provide all the data and unique markings you'll need. They are well printed and I've found them to be quite good when I've built Hobby Boss kits. I'd be remiss if I didn't mention the excellent packaging. In addition to the usual careful bagging of the sprues, there are two additional boxes within. One is compartmentalized for the upper and lower fuselage halves and the other contains the clear pieces, tires, intakes and a few other pieces. As usual, some of the more delicate bits are wrapped for additional protection. 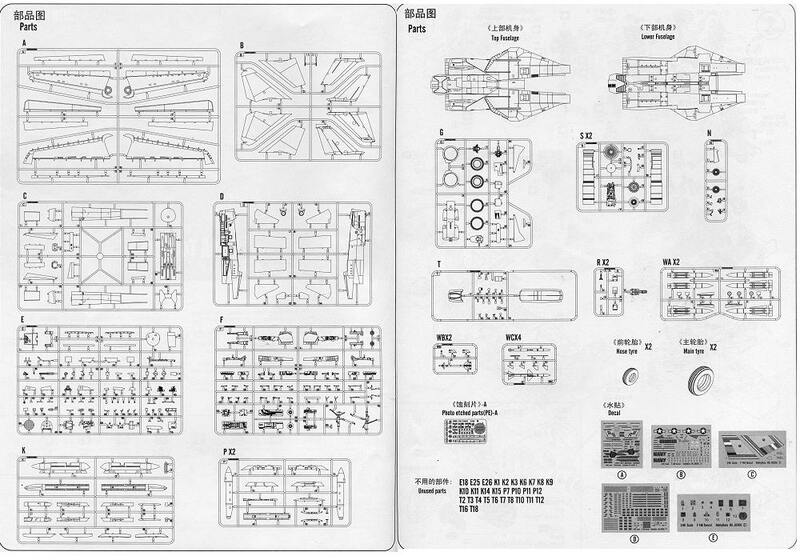 Thanks to all of you who wrote in and reminded me that I forgot the Fujimi and Academy kits. Heck, there may even be more!